YOU ONLY HAVE 15 DAYS TO REQUEST A MVD HEARING AFTER YOUR ARREST IN ORDER TO PREVENT SUSPENSION OF YOUR DRIVING LICENSE! Failure of law enforcement to observe proper chain of custody for any evidence seized. Arizona DUI laws provide for harsh and severe punishments. Thus, I fight aggressively for your rights in order to reach a favorable outcome for your case. This can be through negotiating a lesser charge, complete dismissal or even acquittal after trial. I will never allow my client to plead guilty to a DUI without a detailed and comprehensive investigation of the matter. Driving under the influence can be charged as either a misdemeanor or a felony, depending upon your record, age of vehicle occupants, or whether there were serious injuries. If you are arrested for a DUI, you have the right to refuse to do the field sobriety tests and the portable breath test that the police want you to take in their field investigation. However, Arizona law requires that you take a blood or breath test after you are arrested and brought down to the police station. YOU ONLY HAVE 15 DAYS TO REQUEST A MVD HEARING AFTER YOUR ARREST IN ORDER TO PREVENT SUSPENSION OF YOUR DRIVING LICENSE! Therefore, it is extremely important that you consult an experienced attorney after your arrest, so that immediate steps can be taken to preserve your right to the MVD hearing and to prepare a defense against The DUI charges. Your freedom and record are too important to entrust to a non-qualified attorney. I have successfully defended hundreds of people with their Drunk Driving charges. I have experience and proven results handling DUI cases in all Arizona courts. Before you sign with an over-priced attorney, let me give you an opinion on your case. 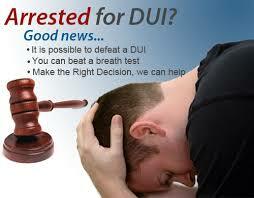 You don't have to pay more than $5000 for any Misdemeanor DUI case. IF YOU HAVE BEEN CHARGED WITH A DUI, CONTACT MY OFFICE TODAY FOR A FREE CONSULTATION ON HOW TO PREPARE A SUCCESSFUL DEFENSE. For more information about how we can help you, please complete the enquiry form. Or call us during office hours.